The hypothalamus is a portion of the brain, located just above the brain stem, roughly the size of an almond. Though small, it’s incredibly important as it is responsible for certain metabolic processes and other activities of the autonomic nervous system. One of the most important functions of the hypothalamus is to link the nervous system to the endocrine system via the pituitary gland. The hypothalamus controls body temperature, hunger, thirst, fatigue, sleep, and circadian cycles. Ok, so I should just avoid MSG and aspartame, right? Absolutely. However, you need to know that there are over 40 hidden names for MSG on food labels. FORTY?!? Yes. 40! 4-0. So, foods labeled NO-MSG or MSG-Free (think Chinese restaurants) may not have actual MSG added to it, but if they contain any of these ingredients, there is STILL MSG IN THE FOOD! When you eat real, whole foods, you automatically avoid MSG, asparatme and other excitotoxins. No need to memorize the whole list of different food additives and E numbers, simply skip the processed junk and EAT REAL FOOD! I will add this page to my page’s favorite..
Great info! 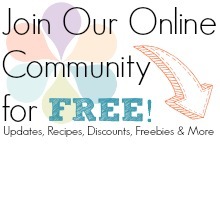 Thanks for linking up to healthy 2day Wednesdays! I knew thre were other names for MSG but I didn’t know there were 40! Crazy! And crazy how the FDA allows it! According to Dr. Blaylock in his book “Excitotoxins”, soy sauce ALWAYS contains MSG. There are probably thousands of identical copies of the above list, and it places soy sauce in the “sometimes contains MSG” category. Thank you, Gary! I have Excitoxins sitting on my desk right now! I’ll make a note in the article 🙂 I appreciate the comment!! I took a neurobiology class a couple of semesters ago and we touched on MSG. And congrats – you took a complex subject and made it very easy to understand. I wanted to add something about the hypothalamus… It largely controls the endocrine system. For example, it controls the pituitary gland, which in turn communicates with the thyroid. So a hypothalamus dysfunction can lead to a poorly functioning thyroid. Again, great info and thanks for the post. I enjoy reading this blog regularly. So there are some who say that glutamates are excititoxins, and others who say that most “savory” foods like cheese or even tomatoes have glutamates in them in relatively large quantities (naturally). Parmesan cheese is supposedly 1% glutamic acid, and is one of the most glutamate-rich foods you can find. Is this true? And if it is, then what, if any, difference is there between the glutamic acid and the salt-stabilized monosodium glutamate? What is the basic science behind the neurotoxicity? The best resource I’ve found is the book, Excitotoxins by Dr. Russell Blaylock. That definitely outlines the science behind this…some of those foods will bother people who are extremely sensitive (which is related to impaired Phase II liver detox, by the way) but it is different than isolated, manipulated MSG. Hi Amy, I did not understand your answer to Jorell. Is MSG that we have heard is in some natural cheeses really there? Is this different from the stuff in processed foods? Are natural cheeses and tomatoes from the vine in my garden also bad for people who are allergic to MSG? It IS different…glutamates are there, MSG is not. Some people who are very sensitive to MSG due to liver issues may not tolerate concentrated amounts of glutamates found in cheeses or tomato products, either. When I was most sensitive to MSG, I could not tolerate strong parmesans or sun-dried tomatoes (it was very concentrated in the dried tomatoes much more than fresh). Now that my liver has healed, I can tolerate these foods with no problem, but stay away from MSG in commercial/packaged foods because of it’s toxicity. Hello. I see yeast on the list. Does that include nutritional yeast? Thanks for letting me know. Wow… kinda makes you want to just give up on trying and just eat whatever, as it seems there is little available to eat today that doesn’t have at least some of this harmful garbage in it. Even the “certified organic” label is somewhat misleading, as there is very little in the way of effective regulation on what can be sold with that label. Investigations have found that many “organic” foods are not really what we believe they are. The most annoying thing about the whole “organic” movement is the word itself. It is a total misuse of the word, as the definition of “organic” is as follows: “of, relating to, or derived from living organisms”. Why does everything in life have to have such a high ridiculosity factor these days?? Thanks for the article! Very interesting and informative. I just noticed that whey protein, whey protein isolate, and whey protein concentrate are listed under the hidden names. The main ingredients in my whey protein is whey protein isolate and whey protein concentrate. Does that mean I am gulping down MSG with my protein? I can see how they would aid the taste but now I’m worried I may be building up a ton of MSG with my daily shakes. Any advice or information? It is possible that you are being exposed to MSG through these ingredients. I don’t personally consume, or recommend my clients consume, whey protein because the protein is typically very processed and has become denatured. I feel that it’s preferable to consume whole foods in their natural form, rather than in a processed form. When we make a smoothie, we use whole, raw grassfed milk (or sometimes full-fat coconut milk), nut butter (or seed butter or coconut butter), pasture-raised raw egg yolks, fruits, greens (sometimes) and coconut oil (melted slightly). Pingback: What’s wrong with bouillon? Do you know of any concentrated stock base that does not contain glutamate. Seems they all contain proceeded proteins. If you want to reduce it for a sauce/gravy/demi glace or to have for easier transport or storage, simply continue to boil until it’s the desired consistency. Hope that helps! I am simply writing to leave a compliment from a passionate chef who appreciates the beauty of clarity and good information. This is a great resource and you provide excellent answers. At the end of the day, the answer is simple: Natural food! Everything is simple, it’s cheaper to make and it tastes better. Some of us can do the fancy stuff and thats ok. Thanks for the info and all the work you put into finding this out! Just when you think your safe not buying products with the name monosodium glutamate! And use natural products on our bodies. 1 Ingredient: 100% Pure organic whey from the milk of grass-fed cows, No added sweeteners, preservatives or fillers, Soy Free (no soy lecithin),rBGH/rBST hormone free, & Processed at low temperatures WITHOUT acid treatment. Your thoughts? Pingback: 5-Reasons why MSG is BAD for you? - PEACE, LOVE AND LIGHT! Pingback: Should You Exercise When You're Sick?